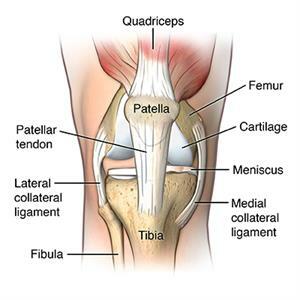 Jumper's knee, also known as patellar tendonitis, is a condition characterized by inflammation of your patellar tendon. This connects your kneecap (patella) to your shin bone (tibia). Jumper’s knee weakens your tendon, and, if untreated, can lead to tears in your tendon. Jumper’s knee is caused by overuse of your knee joint, such as frequent jumping on hard surfaces. It’s usually a sports-related injury, linked to leg muscle contraction and the force of hitting the ground. This strains your tendon. With repeated stress, your tendon may become inflamed. What are the symptoms of jumper's knee? The symptoms of jumper's knee may resemble other conditions or medical problems. Always see your healthcare provider for a diagnosis. In addition to a complete medical history and physical exam, your healthcare provider may use an X-ray to help diagnose jumper's knee. Jumper’s knee is inflammation of your patellar tendon, the tendon that connects your kneecap (patella) to your shin bone (tibia). Jumper’s knee is a sports-related injury caused by overuse of your knee joint. Jumper’s knee is diagnosed by taking a medical history and doing a physical exam. Sometimes an X-ray may be needed.